Adobe showcased 360/VR editing tools for Premiere Pro and After Effects, that are in development, during IBC 2017. A lot of the new additions were centered around the acquisition of the Skybox Studio plugins from Mettle and their inclusion inside Premiere Pro and After Effects. Karl Soule, Strategic Development Manager at Adobe, presented those new features at the Adobe booth at IBC. You can get all the info in his presentation in the video below, where he goes in detail over all of the additions coming to Premiere Pro and After Effects. IBC 2017: VR Workflows Featuring After Effects and Premiere Pro. Adobe is focusing its attention towards supporting VR and content creators, with video presets for VR able to support up to 8K by 4K 360° footage in Premiere Pro. Stereoscopic content will also be supported with presets, that can support a resolution of 8K per eye. 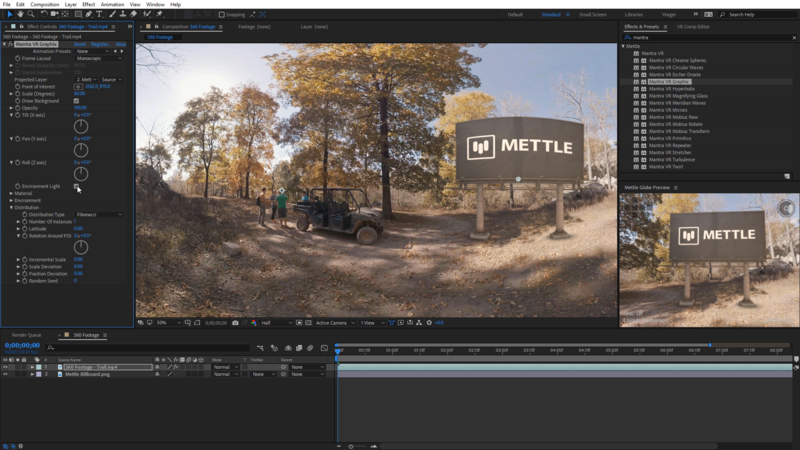 The Skybox effects from Mettle have been included in both Premiere and After Effects under the new ‘Immersive’ folder and allow for smooth results, specifically designed for 360/VR footage. You will now be able to edit and configure ambisonic audio in Adobe Premiere Pro. Ambisonic audio, as stated by Karl in the video, aims to reproduce the sound based off the surrounding environment. This means that if someone on your left is speaking in your footage, you should also hear it coming from the left. The same is true in a 360 video, but the sound source will also change direction when you also face in a new direction in the 360 video. Adobe is also adding a headset editing feature inside Premiere Pro and After Effects. This feature solves a common issue with post-production in 360, where it is difficult to see the effect of the editing when not looking at the footage through a VR headset. This allows for the editing of a 360 video, while wearing a VR headset and looking at the footage in the way it is meant to be seen. Also coming in After Effects along with the Skybox tools is an Equirectangular converter tool that is able to convert traditional footage into 360 footage. Presets are available inside the Converter. Another addition in After Effects is the Cubemap view of 360° footage. This view lets you see all the angles of your 360° production in the shape of a cube, where the front, back, left, right, up and down views of the footage are displayed. This Cubemap view can also be flattened, for a 2D representation of the 360° production, facilitating work for rig removal and motion tracking. 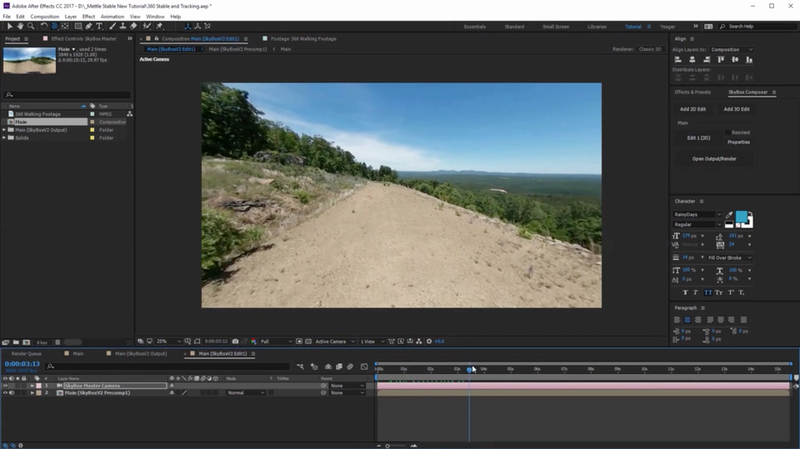 A new built-in feature in After Effect called the VR Comp Editor Panel, which allows the conversion of equirectangular view into specialized formats, such as the ones used by Facebook or for a spherical view. 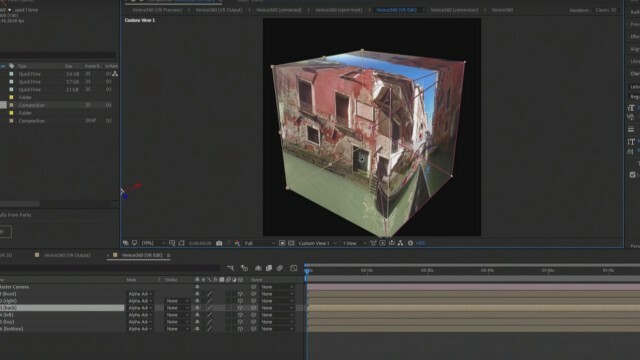 Custom 2D and 3D edits of footage can also be made using the VR Comp editor.